Were you satisfied with the Halloween costumes in the stores this year? I wasn't. Last year Lulu was an astronaut. I got that costume at Target. But when I looked for something similarly interesting at Target and at Petco, I was sorely disappointed. I had the same problem at Party City. PetSmart also left me cold. So I kind of created two costumes for Lulu with some jerry-rigging. Here's the World War I Flying Ace in the most sincere pumpkin patch Mom could find. Lulu as Snoopy! She's wearing a red scarf I found on sale at Macy's and a pilot's cap from my Snoopy doll from Build-a-Bear Workshop. The cap doesn't fit great, but it was only for the picture. And the costume was relatively inexpensive. Lulu's next costume was a bit more expensive, but far more fun if you like a certain Doctor. I'm a beagle now. Beagles are cool! Doctor AROOOOOOOO! Lulu's in a sportcoat I found on sale at Macy's (but not nearly as cheap as the scarf was. Not by a long shot. By the way, Lulu is a Boys size 5, if you're curious). The bowtie I got at Party City, which has a slew of accessories separated by color at reasonable prices. And, finally, my sonic screwdriver pen in her pocket. Because what's the Doctor without the sonic! 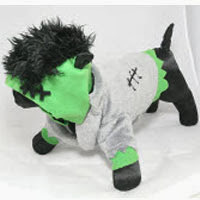 Now -- if you don't have time to get creative with costumes, and you need one NOW, head to Pet360.com. Monster Doggies!! In pink or blue. 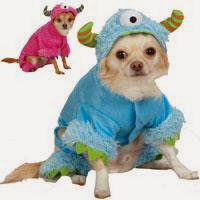 Now, clearly its a little late to buy a costume for your dog for this year, but you can always get one for NEXT year. Plus, now it's time for holiday shopping, and Pet 360 has everything you need! OMD, the WWI Flying Ace costume is TOOOO cute! Rita hates to dress up. 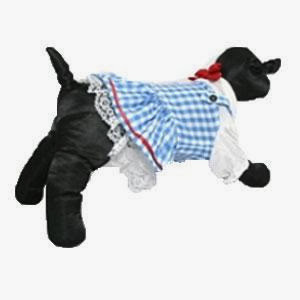 If she would tolerate it, I'd make her the Scarecrow, to go with my Dorothy costume!